TCM: What is Cassilon’s background and ownership? SC: Cassilon is a deepsea tank container operator owned by the Cassells. In 1996 we moved our young family, from an expatriate life, back to the UK to settle and formed Cassilon to run the one contract that we brought with us. The contract involved moving tank containers from Illinois in the US to Botswana in Southern Africa on a just-in-time basis, doing everything from ordering to fulfilment which we are interested. 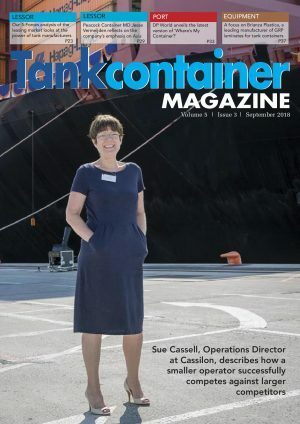 TCM: Tank container operators tend to be more family owned than lessors. As an operator, what are the benefits of family ownership for Cassilon? SC: Being a small family owned company has always meant that we have a huge amount of flexibility and that we can take decisions immediately. We are quick to recognise issues when they arise and are quick to resolve them or to present solutions. Our customers benefit from this while the benefit to ourselves is that we can pursue directions in which we are interested.